12/12/2018: Completed Tasks 2 & 3, with a Book Task being chosen pending my mood and the last door reveal. Book hunt for human rights: Search your shelves for books with titles containing human rights words such as (but not limited to): hope, friendship, equality, justice, love, liberty, etc. Put them in a stack and take a picture for posting. (5 book minimum). Apparently this task was a little harder than I thought it would be. Most of my physical bookshelf books are all Romantic Suspense with some random YA or fairy tale retellings. And somehow none of these books have even the example words listed above. We're either looking at words like dead or dark or a lot of other stuff. 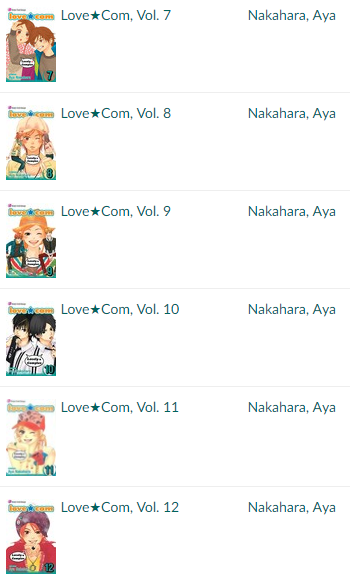 I found three books with the word love, but that's it. 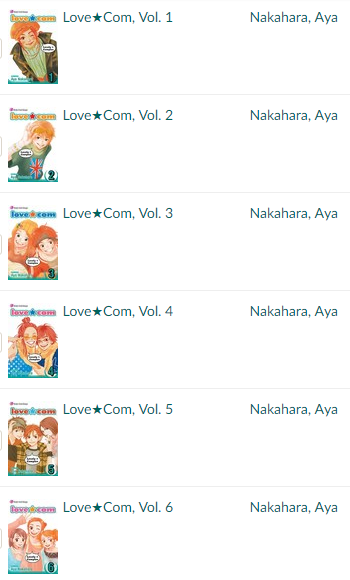 I might go through my digital shelves for a look see and maybe update later. Alright! Here are my shelves of love... and some other books! 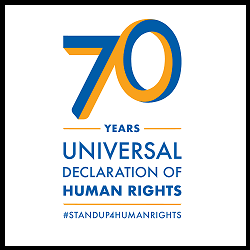 This year is the 70th anniversary of the Universal Declaration of Human Rights. Find 3 books on your shelves with protagonists or other key characters who are -- or can reasonably be assumed to be -- 70 years or older. This was not an easy task, but I was determined that I had read at least one or two books wherein a key character is surely 70+ years old--I was sure none of my books had a main protagonist who is even 70 years old. Upon further searching, I found out that at least one book I've read had a protagonist who is 70+ years, but the book switches back and forth through time wherein we see the main protagonist as a young girl (Kate Morton's House at Riverton)... so I wasn't sure how well this one counted. Fortunately, I DID come up with at least two books off the top of my head. 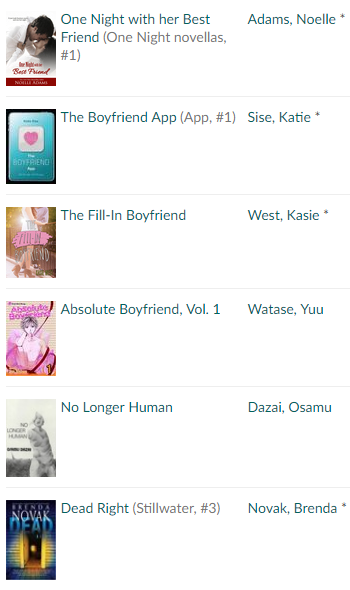 Being that I read mostly YA for a long time, there weren't a whole lot of main protagonists over the age of twenty. Even the romance novels I read only have protagonists in the 20 to 40 age range. So I'm lucky to have found a third book to list. Unless of course, I decided to go with those eternally youthful looking, yet obviously hundreds of years old characters like vampires, fairies, or demons, oh my! My second pick might be stretching it a little bit. 1. 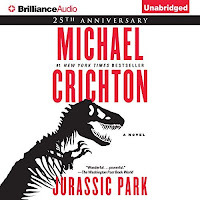 Jurassic Park by Michael Crichton -- Recently listening this book, there was a monologue by our powerful, foolish, rich multi-millionaire, John Hammond, stating that he is 76 years old. He's a pretty essential key character in this book, as the man who created Jurassic Park. 2. Harry Potter and the Sorcerer's Stone by J.K. Rowling -- I Googled "how old is Dumbledore" and got the response "about 150 years old" (though other sources mention that he was truly 115 years old when he died). Either way, this book (as well as the rest of the Harry Potter books) will do, because I figured that he's pretty old anyway... so it counts, right? 3. The Shadowy Horses by Susanna Kearsely -- Not a main character, but a key character, Peter Quinnell is the old archaeologist who offers the main heroine, Verity, a position on his dig in Scotland. He's present throughout the book and is quite adamant that there is something to find. The symbol of Human Rights Day is the dove, which in its incarnation as a homing pigeon is also renowned for its navigational skills. – Tell us: Did you ever get so thoroughly lost (either in the days before GPS or because GPS, for whatever reason, was of no use to you) that you wished you had a homing pigeon to guide you? I don't think that I actually wished for a homing pigeon as much as just for somewhere I could stop and ask for directions. My friends and I were driving around on a weekend vacation one time in Kansas City, at least ten or so years ago, and realized after the second pass through a familiar highway that we didn't know where we were going. This was a time before Google maps was a thing, and your few options in GPS included the infamous, yet quite useless (IMO) Garmin. Unless you update Garmin for a pretty expensive fee, you don't get a lot of in date information on highways or any roads or new businesses. And of course, the Garmin my friend had in her car didn't have those nifty little "there is heavy traffic coming up, here is an alternate route." I'm sure Garmin has become more advanced and user friendly, but I don't know that, since I've just stuck with Google maps at present. And so there was one particular morning, while trying to find a certain mall where we could do some window shopping, we couldn't find the right exit. There were a couple times where the GPS would tell us to turn off at a certain exit that wasn't actually there, or was closed off due to construction. We ended up outside of the main city and had to try programming the hotel's address again in order to get back. The truth is, yes we were a bunch of ignorant young kids who had no sense of direction. And I hadn't gotten a chance to print off a bunch of maps and directions to other possible locations to go to. We were completely reliant and dependent on my friend's Garmin GPS system. And it wasn't taking us where we'd intended to go in the first place. I think we even started joking that my friend had ignored enough of the Garmin's directions in the past that it finally got fed up with her and decided to just take her out into the middle of nowhere and leave us all for dead. On the other hand, as my brother has recently told me, Kansas City randomly adds and takes away freeway lanes and exits. He hadn't really lived there for very long, but he said it took him a long time to even figure out how to get around town because there was always construction somewhere as another entrance or exit or highway was added to one route or another. In a way, the constantly updated Google maps might have been a bit more useful to us. Though in contrast, there was that one time that my best friend and I were in danger of getting lost if I hadn't just turned back around and tried to back track. We were in Colorado and had just left the Cliff Dwellings where I stupidly didn't realize that my Google maps would not work in the mountains. It took me a while to realize that, well duh, cell service wasn't going to be available, ergo, no data and no Google maps. Surprisingly, this was one time that the old Garmin I'd had in my car at the time actually came in useful since it didn't run on cell service data, but actually picked up satellite. Human Rights Day was declared by the U.N. General Assembly, whose seat is in New York City. Treat yourself to a Manhattan (classic recipe: https://www.liquor.com/recipes/manhattan-2/ ; virgin [non-alcoholic] recipes: https://www.anallievent.com/virgin-manhattan/ , http://www.1001cocktails.com/recipes/mixed-drinks/800238/cocktail-virgin-manhattan.html and https://www.liquor.com/recipes/not-manhattan/ ) or to a bagel or pastrami sandwich and share a photo with us. I will probably try to do this one. If I don't do a Manhattan, I might do a bagel. I'm not really big on hard liquor, so it'll be a guess as to whether I go for the classic Manhattan recipe or the non-alcoholic one. Read any book with strong female characters, or written by an author from any minority group; any story about a minority overcoming their oppressors either individually or as a group. OR: A book set in New York City. 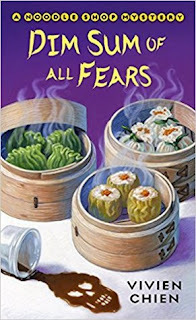 I will be claiming Dim Sum of All Fears, finished reading on 11/27/2018 for this door. At the rate that I'm going in my reading life, I don't know how many other books I'll be able to read the rest of the game. Anyway, Vivien Chien is a Taiwanese-American author, so this book will fit. The book title is linked to my review. Enjoy!